During the early seventeenth century, a weaver named Pierre DuPont traveled to the Levant. Upon his return, he claimed to have discovered the technique of creating Turkish rugs. Oriental rugs were extremely expensive during Bourbon times, and a French manufacturer that could create the same type of rug would lower the price significantly. Henri VI of France–the reigning monarch at the time–took advantage of DuPont’s skills and established a workshop for him at the Louvre. In 1627, King Louis XIII founded a manufactory for DuPont and his apprentice, Simon Lourdet, on the site of a defunct soap factory in the sixteenth arrondissement (also known as Quai de Chaillot). The name “Savonnerie” was born from the French word “savon” meaning “soap.” DuPont and Lourdet worked together, weaving rugs under a royal patent for the king and other nobles, until they had a falling out and split up. Lourdet remained at the Chaillot location while DuPont went to his workshops in the Louvre, though both continued to make Savonnerie rugs. DuPont’s discovery was an ancient weaving technique called the Ghiordes knot. The Ghiordes is the oldest known knot used in carpet production. It consists of a symmetrical structure achieved by passing a single weft yarn over two warp yarns, pulling through between before severing the yarn to create the pile. The Giordes knot is characteristic of Turkish rugs. This weaving technique created a more durable structure than the tapestries created by European weavers. Tapestries were hung on walls, while the Turkish style French rugs were sturdy enough for foot traffic. When Louis XVI came to the French throne in 1643, he was a mere five years old, but in 1659 he began a phase of renovations for the Palais de Louvre, at which he commissioned 274 carpets–all of a length of twenty-nine feet with varying widths–from the Savonnerie manufactory. The process was grueling and did not end until 1697 when the final carpet for the Louvre was woven. His favorite artist, Charles Le Brun, drew up cartoons of rug designs for the Louvre’s Grande Galerie. The designs consisted of a dark-colored background, filled with motifs of scrolls, cornucopias, flowers, arms of France, and the monogram of Louis. Inventories of Louis’ possessions show that in the early years of his reign, he had a number of Turkish and Persian rugs, though they were gradually superseded by Savonnerie carpets. 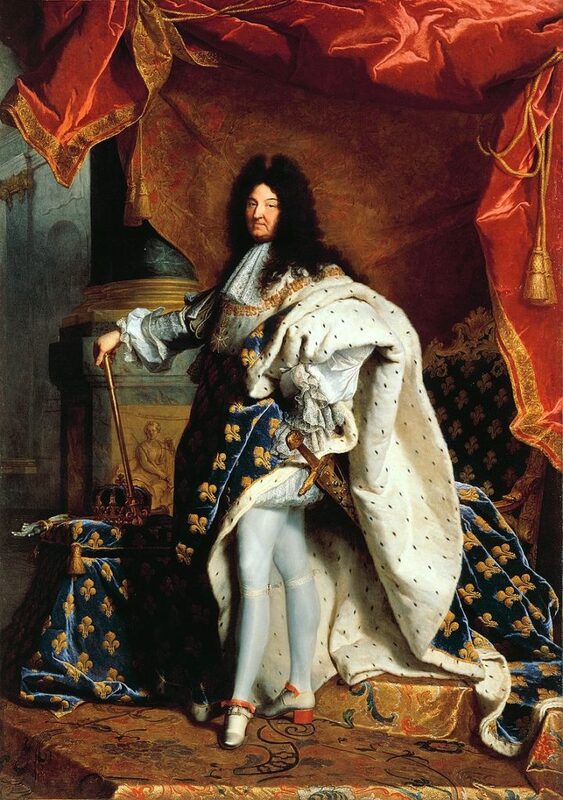 At the same time, King Louis was hard at work supervising the construction of his grand new palace at Versailles, and he moved his residence at the Louvre for Versailles in 1678. Classic French with the feminine flowers and bouquet of roses. 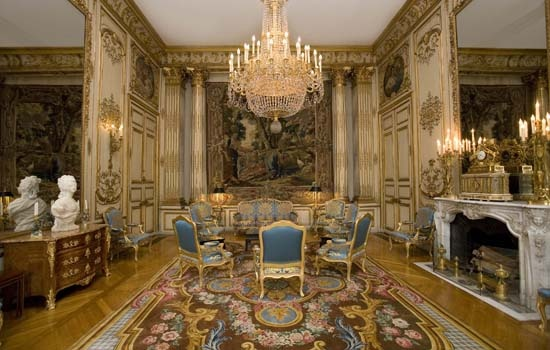 Savonnerie carpets also served as grand diplomatic gifts from Louis to foreign ambassadors and other notables. He gifted a collection of music-themed Savonnerie creations to the ambassador of Siam, where they stayed intact and in use for hundreds of years. The legacy of the Savonnerie manufactory was a great one. 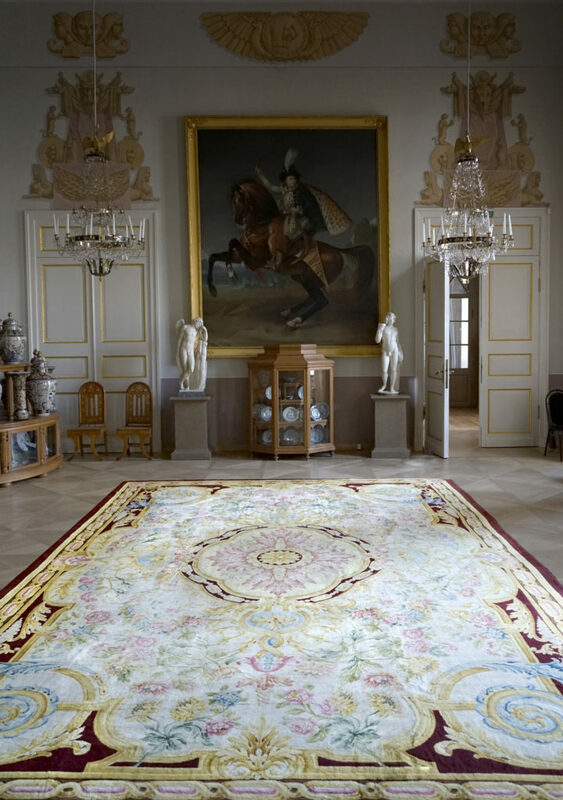 The carpets remained the exclusive property of the French rulers until 1768. In the same century, the classic Savonnerie designs were updated with lighter, brighter colors and Rococo elements. The production of Savonnerie rugs declined in the latter half of the eighteenth century, until 1805 when the designs were revived by Napoleon. Twenty years later, the Savonnerie workshop merged with the Gobelins tapestry manufactory. This marked the end of its independence, though the production was ever steady. A number of the first Savonnerie designs still exist today, having survived the Fronde, the French Revolution, and two World Wars. They have avoided going out of fashion by reinventing themselves from Louis XIV style to Rococo to French Empire to Art Deco and beyond. 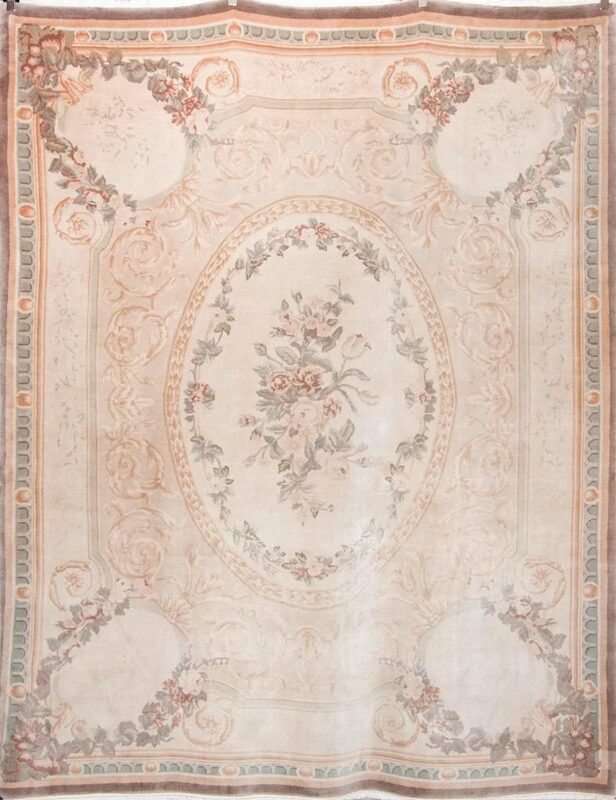 Antique French Savonnerie rugs exemplify the formal grace and elegance of classical European design. 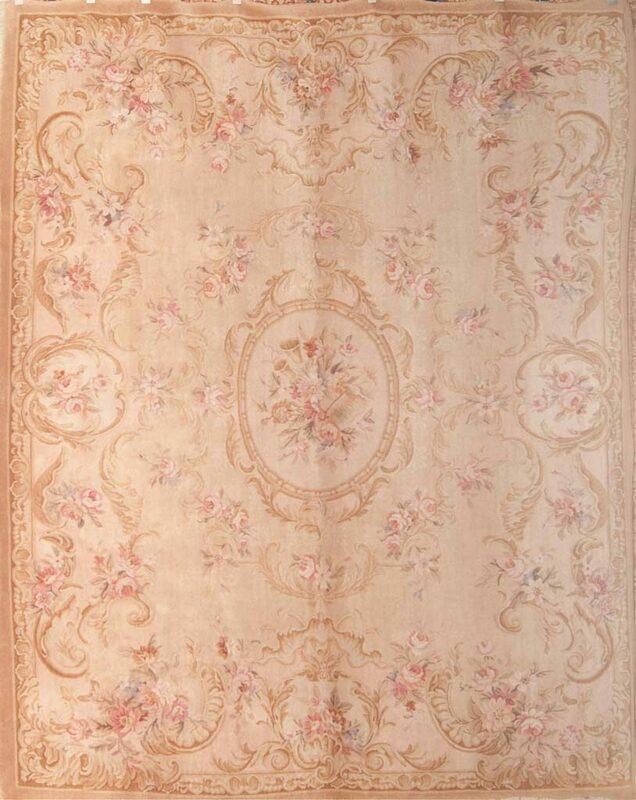 Like Aubusson tapestry rugs, Savonneries originated in France when European taste turned away for a time from Oriental carpets in the later eighteenth and earlier nineteenth centuries. Named for nearby factories that produced soap or “savon,” Savonnerie rugs shared with Aubussons a Neo-Classical taste for naturalistic flowers and swags or garlands in soft colors on a dominant ivory field, except that they were made in knotted pile rather than tapestry technique. Later, carpets of this kind were made in other European centers, most notably in Spain.